Keep things classy, clear, and clean with these Clear Plastic Cups. Perfect for weddings, barbecues, holiday parties and other special occasion, these versatile cups are sure to make your day easy and fun. These cups are great for serving punch, wine or desserts. 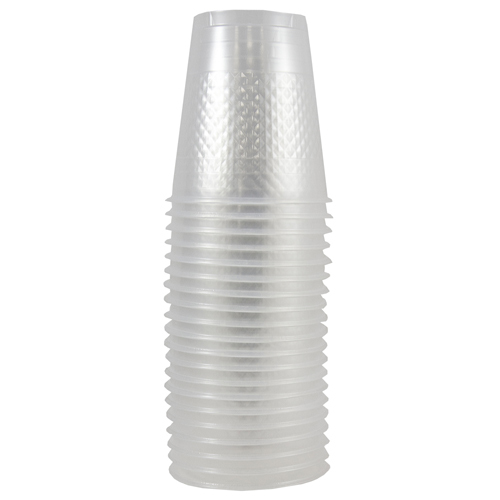 Sturdy, elegant, and refined, Clear Plastic Cups will add a stylish feel to your party in an affordable fashion. A great substitute for glass, these cups are simple to clean up and more child-friendly than glassware. Best part? When the wild party or elegant event is done, all you have to do is throw these cups out. No need to even put your sink on! Clear Plastic Cups are available in two different sizes, 9 ounce and 10 ounce. Both options come in packs of 20. So make a toast with your whole family and make it clear how much you love them with our lovely Clear Plastic Cups! We have more clear disposable tableware so keep shopping! !